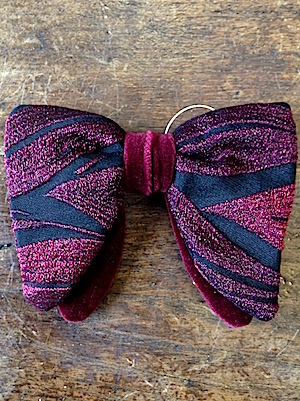 Vintage 70s/80s Navy Clip-On BOW TIE in Burgundy & Black Zebra Print & Burgundy Velvet! Home > Items just added 4/3-4/17 > Vintage 70s/80s Navy Clip-On BOW TIE in Burgundy & Black Zebra Print & Burgundy Velvet! Vintage 1970's - early 1980s clip-on bowtie. Add a little flair to your vintage formal wear with this funky bow tie in a burgundy and black zebra print brocade with with burgundy velvet! Top portion of the bow tie is a brocade with a velvet layer underneath and a velvet knot. More than one available! This style also available in Navy! Length top to bottom: 4"